Easily reference the Madrax bike storage guide for your next bike storage project. Fill out the form and you'll be sent a link to download the file. The contact information you provide will be used to send you the guide and keep you informed on other resources we think you'll find valuable. You will be able to unsubscribe any time. A guide to efficiently storing multiple bikes. How Long Will the Bikes Need to be Secured? 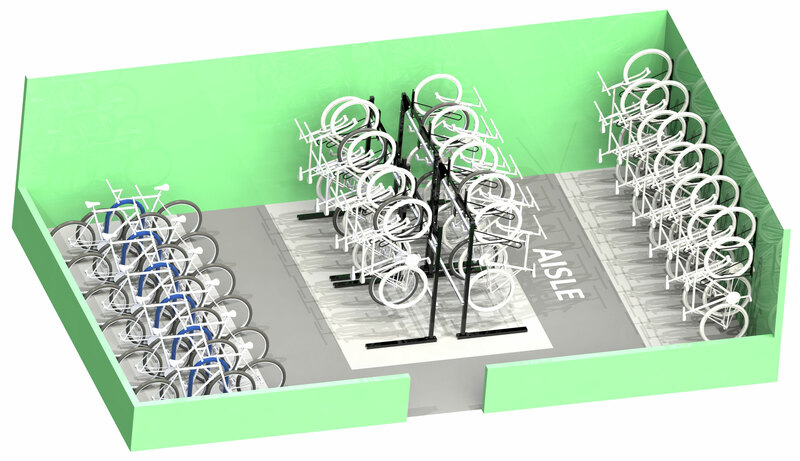 When planning a dynamic space designed to secure bicycles, you'll either be creating a bike storage or bike parking solution. 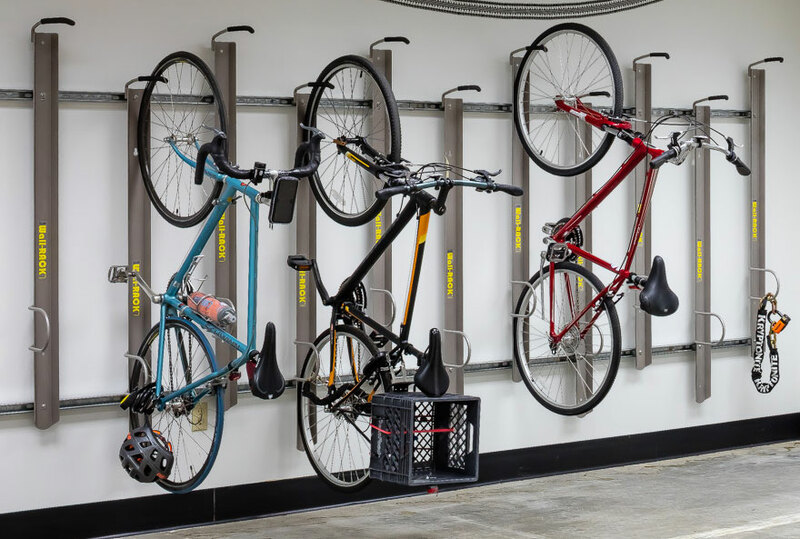 Though the two terms are used interchangeably, bike storage (also referred to as Class I Bicycle Parking) is considered long-term bike parking and typically provides shelter from weather, thieves/vandals and other elements. 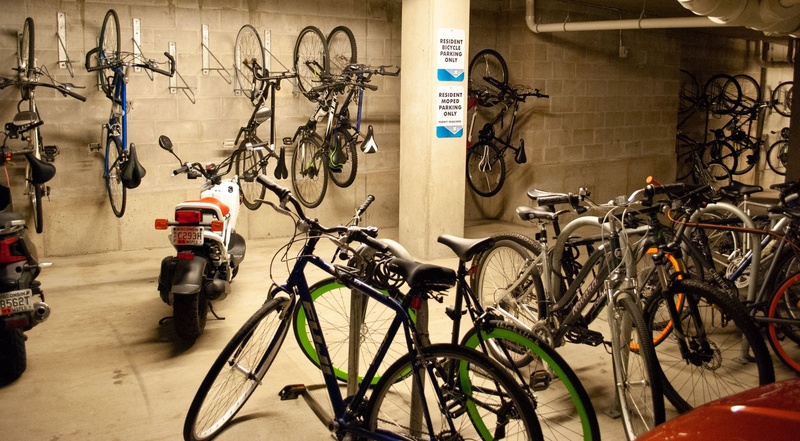 A bike room is an application of bike storage and a growing trend in many residential and business facilities. Bike parking (also referred to as Class II Bicycle Parking) is commonly designated for scenarios where parking is only needed for the short term - typically less than 2 hours. Bike parking is usually outside, with more exposure to elements that make the solution less secure. Common examples of bike parking can be found on sidewalks, in parks and in front of commercial businesses. Bike storage: Long-term bike parking with increased security. Bike parking: Short-term bike parking with basic security. 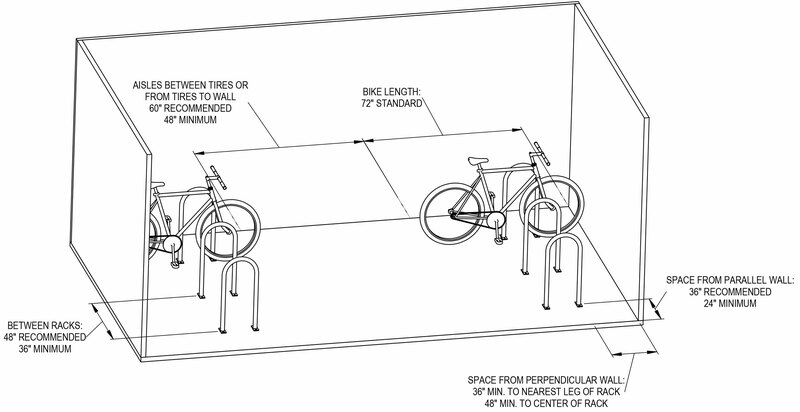 For this guide, we will be focusing on recommendations and tips to create efficient and usable bicycle storage spaces. As with any new building or revision to an existing structure, make sure you are aware of your local ordinances. 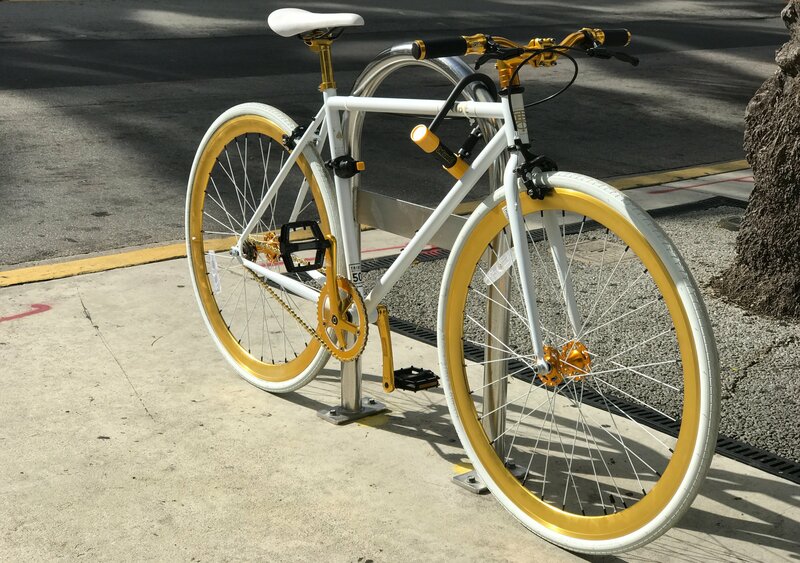 Many cities have standards in place that regulate how many bike parking spots are required, what types of racks can be used, as well as spacing for and between spots. The surface that the bike racks will be installed on will also play a role in determining the best options for your bike storage area. 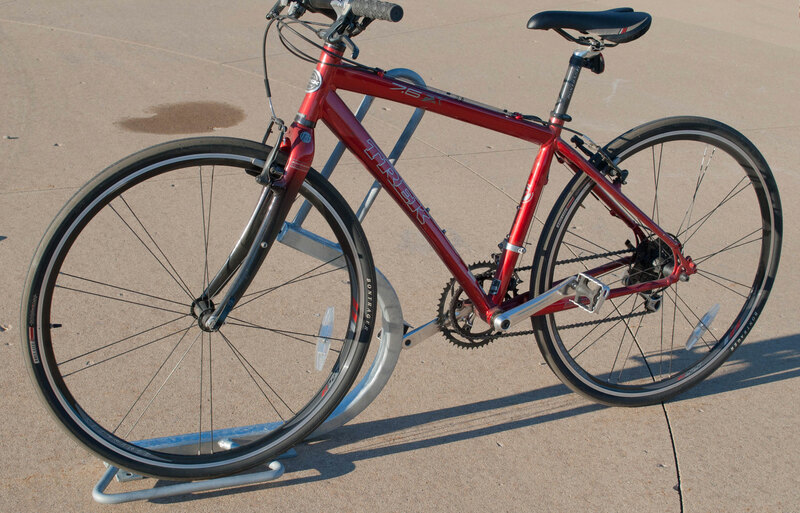 Concrete is ideal for installing bicycle parking racks. The best case would be to install the rack when the concrete is poured. If installing into existing concrete, there may be limits as to how deep the concrete can be drilled and many racks require it be fastened to the wall with an anchor bolt. 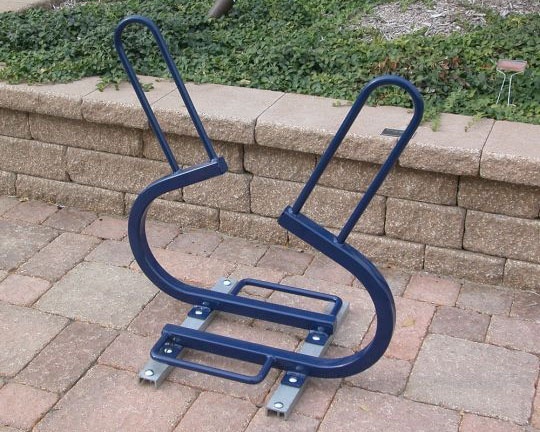 Concrete block, brick and the type of studs behind drywall - steel or wood - all require certain mounting hardware that may or may not be offered for certain bike racks. In addition to the materials that make up the surface where your bicycle storage will be, it will be important to identify any obstacles and clearance requirements. 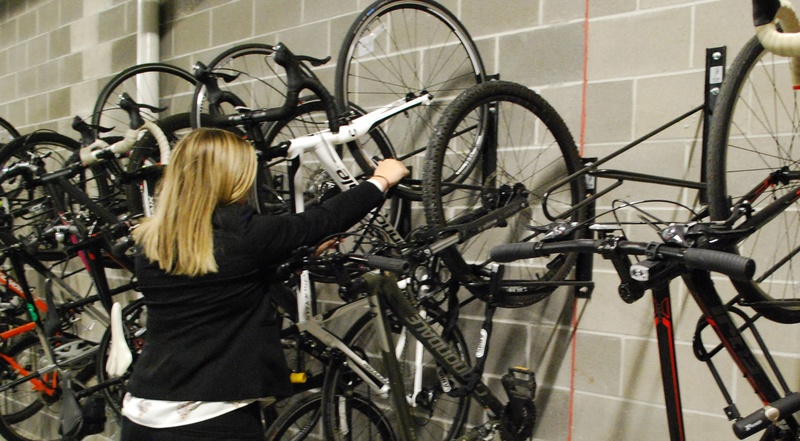 If the bike storage area will have mechanicals affixed to the wall, it may limit certain types of racks that would be installed. 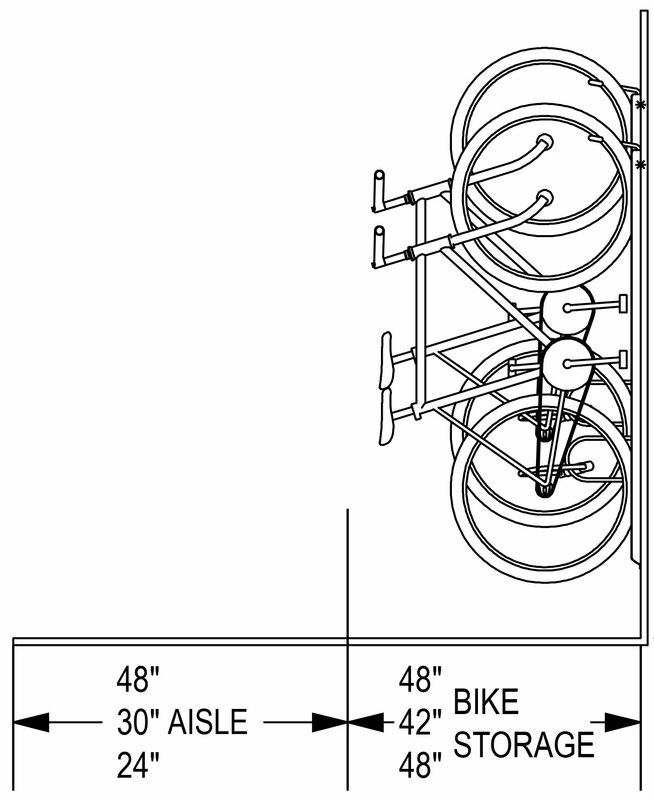 Select vertical bike racks, for example, require a length of smooth wall space for proper installation. 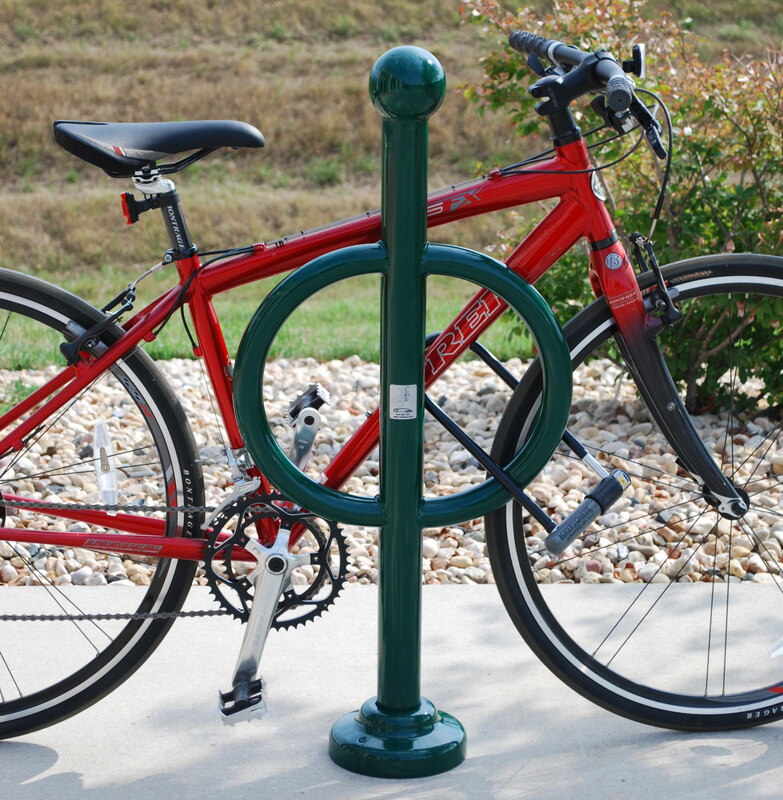 The specific number of bike parking spaces needed for your bike storage area may be directed by local ordinances. The APBP Bicycle Parking Guidelines also offers a comprehensive guide for determining bike parking requirements. The following are a few of the applications from the APBP to guide the volume of bike storage needed. In communities that are densely developed, more urbanized or which have higher bicycle use, a .5 space/measurement should be added for educational, civic and commercial facilities. 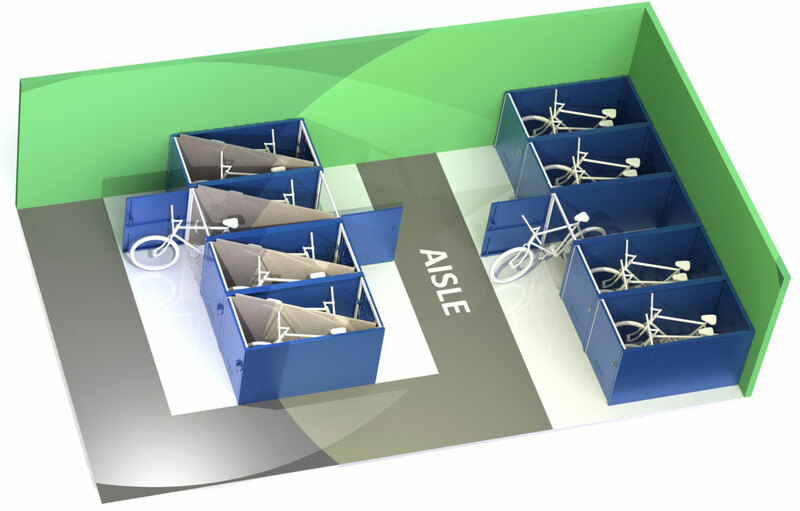 After factoring the attributes of the bike storage area, weighted against code capacity requirements, you can start evaluating different bike storage systems or combinations of systems that will guide you to the most successful layout. To be successful with your layout, it is critical to design an area that will satisfy the people who will be using the bike storage. Use these common objectives for bike storage to help build out your design. This type of design works well for commuters who rely on their bike to be a primary mode of transportation. They will appreciate the ease in accessing and returning their bike to storage. As well as the the reduced chance their bike is damaged by another bike being put into or taken out of storage. The main drawback to this design is the lower density of bike storage available per square foot. 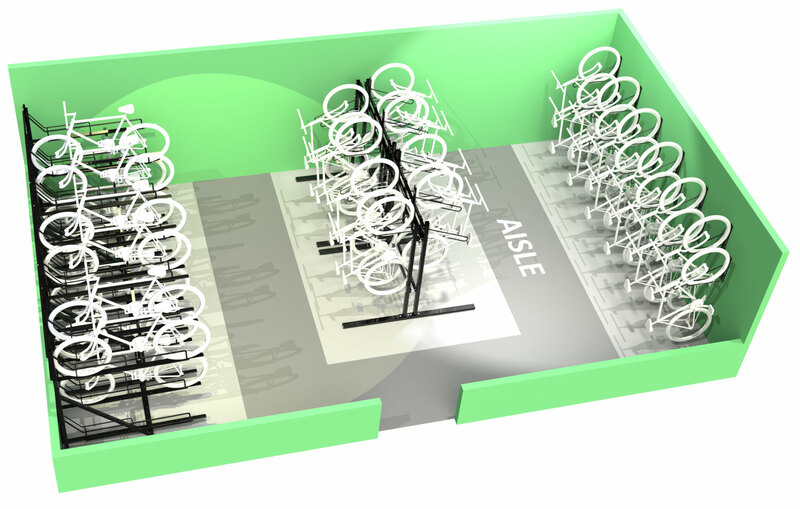 This would offer the highest density of bike storage per square foot and provide the highest value, of any layout, to the facility owner. Providing sufficient bike parking for those would want to use it would also satisfy a greater number of people. The main drawback is that this design might not be functional if users would have certain physical limitations that would not allow them to lift their bike off the ground in order to park it. A balanced design will incorporate a combination of bike storage solutions that serve heavy bike users - who want the extra area around their bikes - and those more concerned with having a space to store their bike. Rooms, cages or other barriers that restrict access to the bikes are also additional elements that will make bike storage areas more secure. 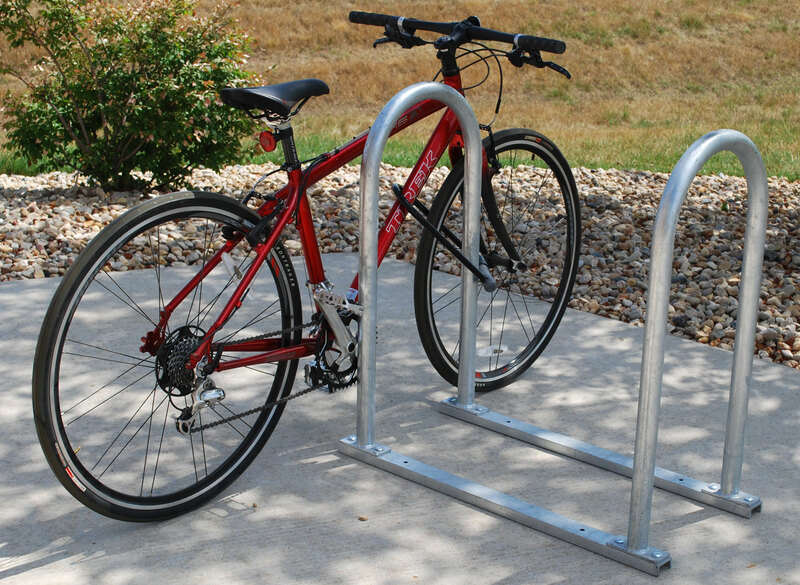 In addition to bike racks, it's worth considering adding other amenities and including them in your layout. Items like benches, repair stations and pumps would increase the overall value and utilization of a bike storage area. 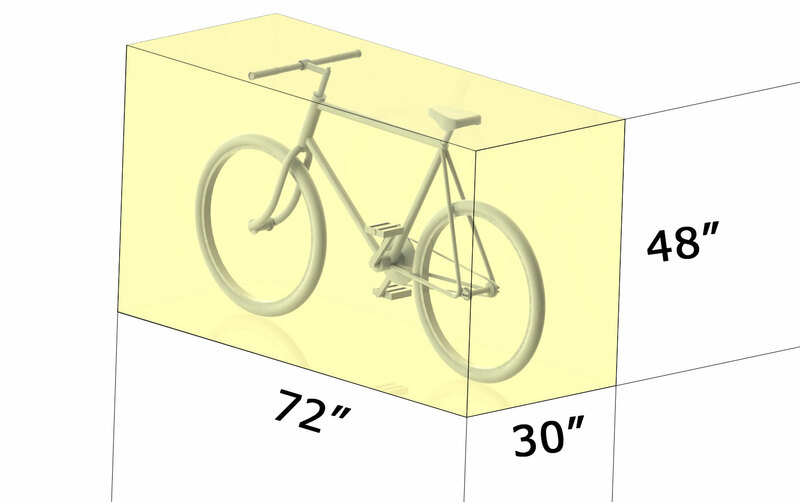 The standard bike dimensions make up the space a typical bicycle will occupy when in a bike rack. 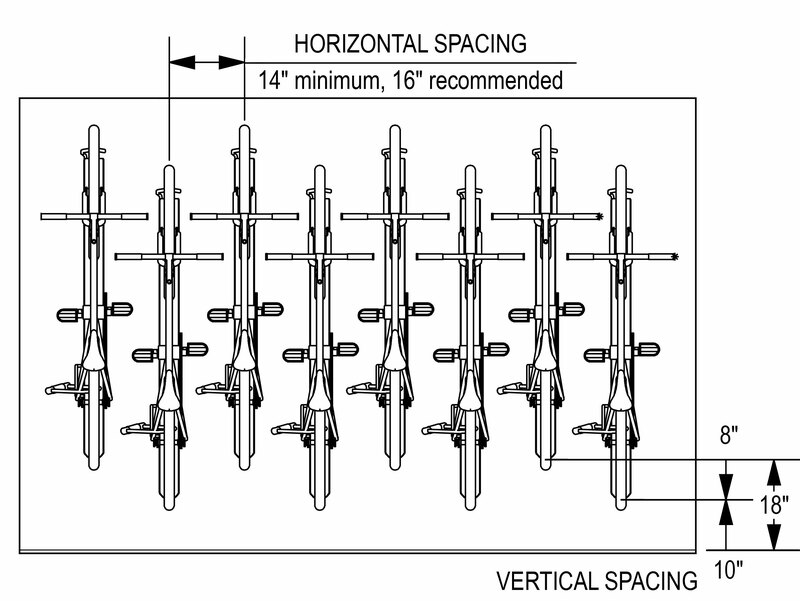 The typical dimensions of more modern bikes like recumbent and folding bicycles should also be considered when spacing bike racks. 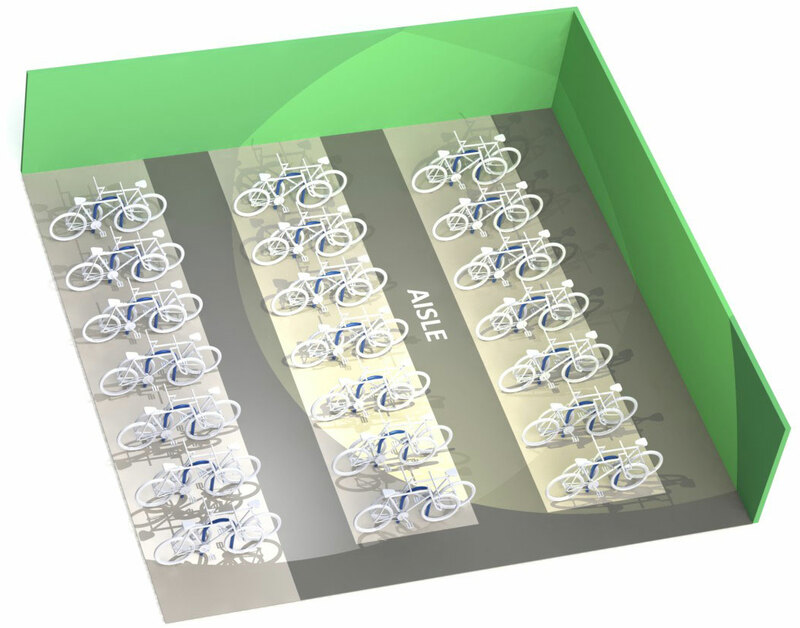 Each bike storage area will be unique in the available space, number of bikes needed to be parked and other requirements. 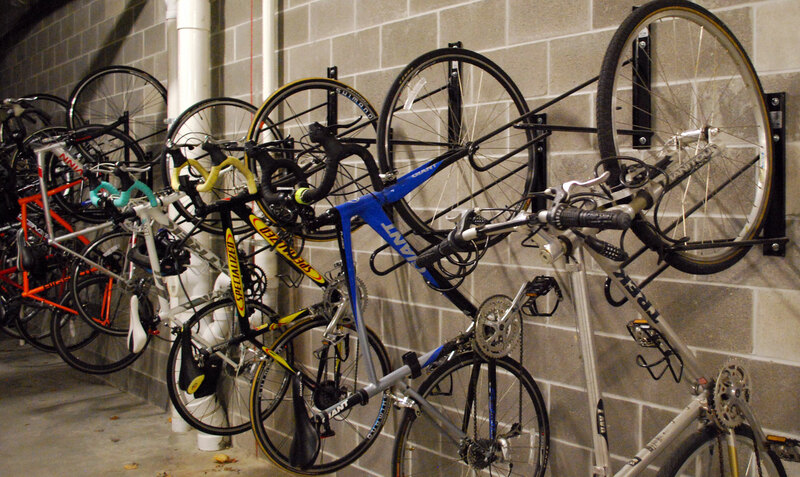 If possible, we recommend following the APBP guidelines for bike storage spacing. 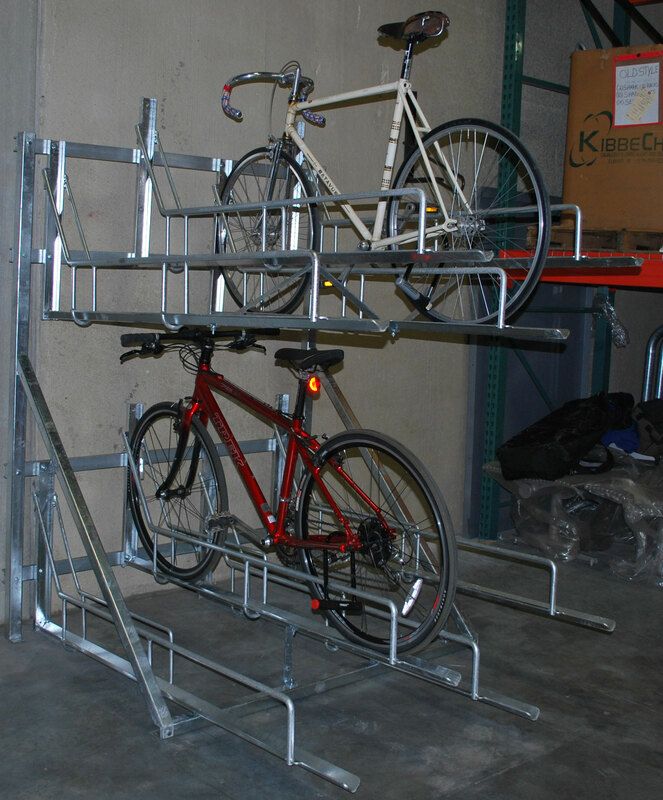 Vertical bike racks are primarily designed and used to maximize bike storage density. This is achieved by vertically staggering the racks where there will be some overlap in space on the common 24-in handlebars. Typically between 8" and 12"
Varies depending on rack used. Can be determined by finding the sum of three dimensions. With these in mind, it then comes down to selecting the type of commercial bike rack that will achieve your bike storage goals. When it comes to horizontal bike storage, there are many styles to select from that provide adequate space around the bike. These would be ideal for bike-friendly layouts. Here are some of the common styles. 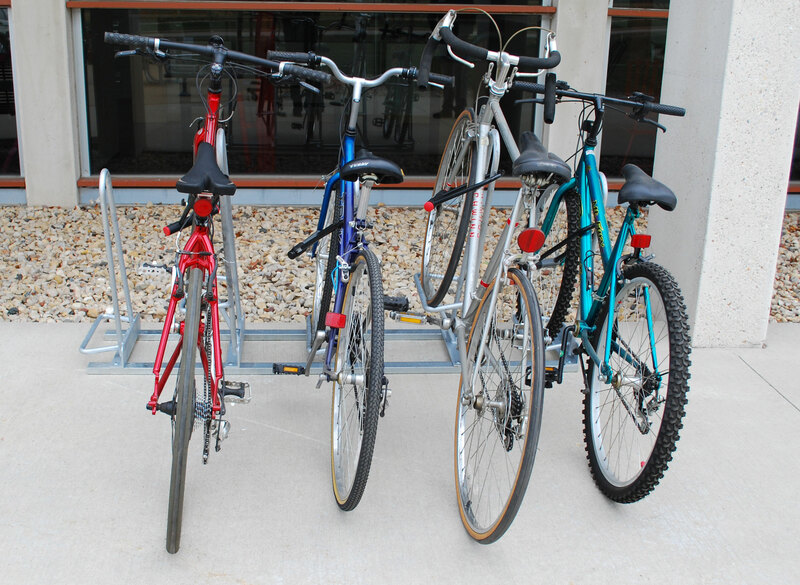 Many of the same styles of bike racks are available in a high-density configuration, where the spacing between parked bikes is reduced. This is typically achieved by making the rack two-sided and/or staggering the height of the bike when parked. 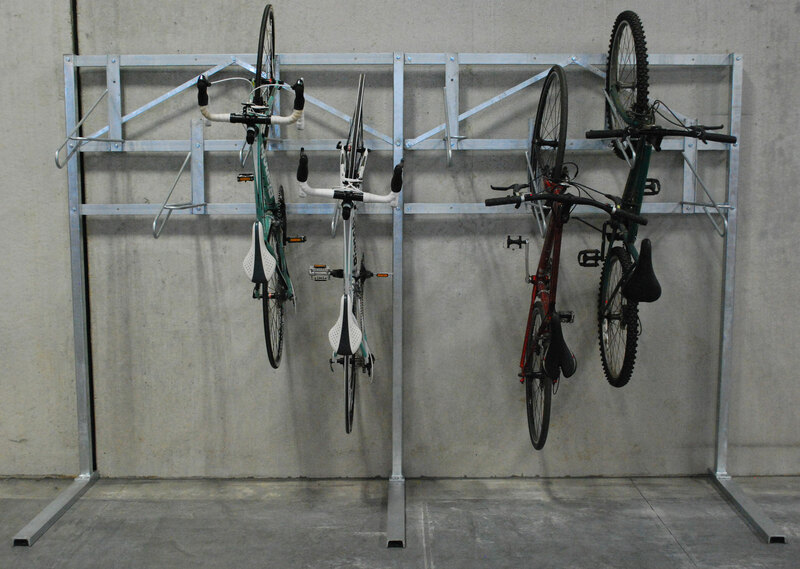 Vertical bike storage solutions offer the primary benefit of reducing the total floor area needed to store bikes. 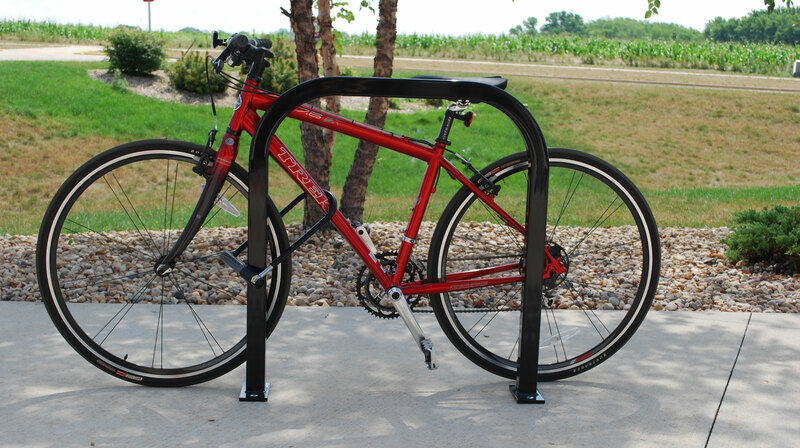 Depending on the type of vertical bike rack, spacing options can be flexible to make them more biker-friendly. They can also be staggered vertically to accommodate high-density needs. Because lifting of the bike would be required to use these racks, they may not be suitable for all users. 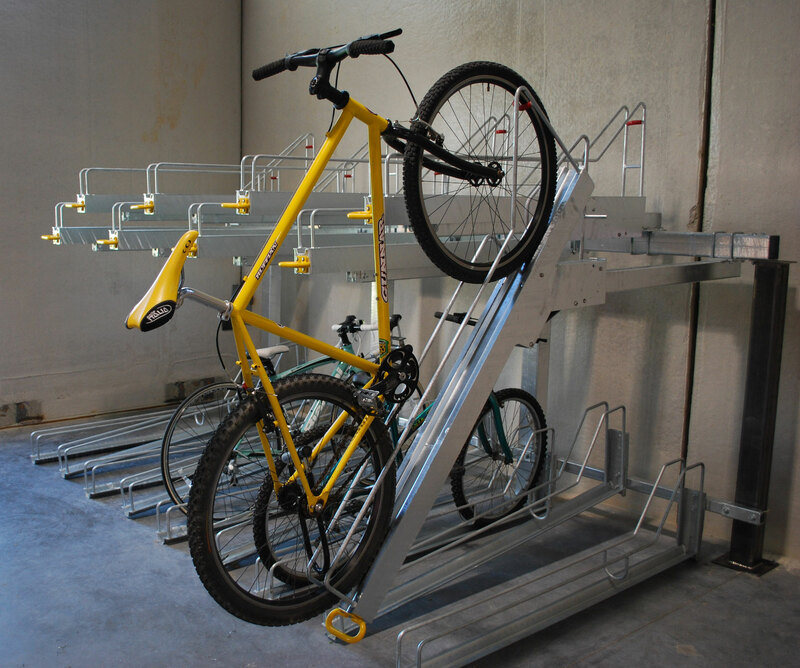 Double-tier horizontal bike storage systems are ideal for high-density solutions and taking advantage of available vertical space. Bike lockers provide an added level of security and privacy when storing a bike and come in various configurations and locking options. Some lockers can can be stacked to handle increased density and others are configured to accommodate storing the bike vertically.